I wrote last week about ‘Broadcasting Social Media‘, and how many conferences are a contradiction in terms when their content is about Social Media, but they have no social interaction or discourse – just speakers broadcasting a social message. This got me thinking. If you can broadcast social, then that says something about the channel that is used, and the content that is delivered through the channel. 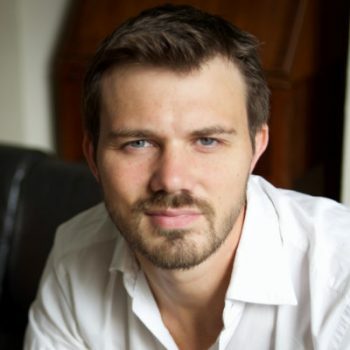 Is it the case, then, that you can have social content delivered through a social channel? Or can you have broadcast content delivered through a social channel? Broadcast is one way. It is static. It does not change according to new information. Social is multiway. It is dynamic. It changes according to new information. Broadcast channels and content are therefore one way. They push, and by definition, a broadcast goes from one point out to many points. Social channels and content are multi way. They push and pull, and can adapt according to the pull. As opposed to broadcast, social starts from many points, and goes to many points, whilst changing as each point contributes. Broadcast channels and social channels are mutually exclusive, as are broadcast content and social content. However the channels and content are not mutually exclusive – in fact, they marry together – meaning we can have a hybrid effect, where by the Channel is Social, but the Content is Broadcast. When this content is delivered through a keynote address, despite the content being social, it is actually broadcasted. The keynote is a broadcast – one point to many (as I describe in Person-to-People), and the keynote structure does not change according to the audience. It is Broadcast Social. Or consider Reality TV. The content is social – it is dynamically generated, crowdsourced, and made from many points. But when we watch it on TV, this social content is being broadcasted to us. It’s also the same with Talk Radio. Consider a company that wants to take it’s existing broadcast content – press releases, for example – and push them on a social channel. This is Social Broadcast, and it is essentially the misuse of Social Media. What else falls into this bracket? Facebook Pages that are used by organisations that push out status messages linked to a blog. Twitterfeeds that publish RSS feeds into a Twitter stream. They are both broadcast content delivered through a social channel. This can also extend to panels at an event. A panel is a social channel (multiway, dynamic, push and pull), however if the panel have decided to broadcast their content, then we have another misuse of Social Media. TV, magazines, radio, and even brochure websites are broadcast both in channel and content. Nothing new here! When both the channel and the content are social, we enter this fourth and final realm. Social Networks like Facebook, when used by the average user, are Social Social. The whole site (channel) is continually changing according to the content. Remove the social content, and the social channel doesn’t exist. Or consider Unconferences. The channel is again continaully changing according to the content. What people want to discuss, gets discussed, and the channel morphs accordingly. Remove the content, and the channel doesn’t exist. This is similar to a 21st century rendering of ‘the medium is the message, but it has now become, in the case of Social Social, that: the channel is the content. Let’s go back to my assertion that blog posts are Broadcast Social. In the model, I then list blog comments as being Social Social. So then where does a blog fit, as a whole, in this model? Or where do events fit in this model, given that I’ve put panels and keynotes in separate quarters? None of these dimensions (Broadcast Social, Social Broadcast, Broadcast Broadcast and Social Social) are wrong or right. They just are. Each of the dimensions can assist each other. The combined effect of these dimensions renders the media as either Broadcast or Social. You’ll notice that through the model there is a orange divide the sections half off as Broadcast and half as Social. The combined effect of a media’s dimensions (some of which are Broadcast Social and some Social Broadcast, etc) positions it either as Broadcast or Social. Let’s take events as an example. Whilst their are keynotes that are Broadcast Social (which as per axiom 1, is not wrong or right), there may also be an unconference element, which is Social Social. This means the event is Social, and not Broadcast. However if you remove the unconference elements, and there is more broadcast activity than social activity, we find we have a Broadcast event. Blogs can also be looked at in this way. The fact that there is Broadcast Social (the posts) and Social Social (comments) renders the blog as Social. Already having typed these, my mind is whirling around with ideas – some around the Nestlé issue and how that is a result of Social Broadcast. Would this of happened if Nestlé had just stayed to Broadcast Broadcast? If you’ve got this far, then go one step further, and put down some ideas into the comments below so we can form this together. Strikes me that most businesses are so steeped in the broadcast paradigm that even when they attempt social channels they still naturally broadcast their content (social broadcast). This is a cultural thing for many businesses (especially those larger & older) that won’t be overcome until they experience the power of social channels. That experience can be either positive (Ford) or negative (Nestlé). But I don’t think that a matrix like yours will be initially understood without this experience. After a powerful experience, good or bad, they’ll more likely not just understand it but begin to embrace it. Thanks for adding your thoughts to the table. you have a clearer understanding than I do on their challenges? I completely concur. This is an excellent place to begin a discussion (with interested parties) that will help a company or organization define where it currently lies with regard to the broadcast/social matrix. The “get it done” aspect of many company cultures and sales cultures wants to make a foray into social because they feel that train is a comin’ and they’ve gotta jump on. But if they neglect the necessary time and attention to “get it right” (i.e. develop a deeper understanding of the nature of social channels and content) they’ll probably commit a gaffe (or a series of them). Then the opportunity arises to step in and educate because their experience has hopefully provided the valuable context necessary to view the matrix with greater openness and clarity. The businesses I work with are all over the map (er, matrix). Some are increasingly embracing social channels and content. Some are very reluctant to even dip their big toe in the water. Totally. There must be a careful approach – but there must be an approach! I know it’s been discussed time and time again, but what approach with these companies do you think works best? Culture is one of the hardest things to change in all the world – be it social culture, organizational culture or personal culture (individual thinking and habits). And when we’re talking about organizations embracing social channels and content, of course we’re also talking about changing culture – difficult stuff. Therefore one approach to such change is to see a small part of an organization embrace and develop a social aspects of their communication, thereby being the pioneers for the rest to follow. Example: I’m working with a home appliance mart that has an old-school sales culture. Getting the sales staff and managers to even consider employing social networks is silly. They are completely broadcast oriented. But the manager of the AV department thinks differently and is eager to embrace tweeting and blogging, hosting small events and demos, making connections and building deeper relationships. We’re believing that the different philosophical approach (the more social approach) will be very effective. Then, once a respected leader in social media is established inside the company and is able to serve as advocate and coach, we are hoping his dpt. becomes the catalyst for culture change company-wide. Further thoughts from you and others? Randy – thanks for drawing out more discussion here! Culture is what it’s down to – I agree. I find most of culture can be changed by language. I work hard with my church to carefully construct the language that I use, as does the rest of our leadership team. What this means is there is a group of use using the same, chosen language. We have saying: culture by design, or culture by default? We try to be the first! Flesh out this statement even more if you would (might make for a great blog post) – and when you have time. Would it be accurate to say that if better terminology is used, it will then need to be defined and explained, thereby creating deeper understanding and higher expectations within the culture of your organization? Yes I’ve alredy written about this idea somewhere. I need to refresh it with the new experience and insights I’ve had. The more I think about this too, I think it does correspond. I’m still getting my head around exactly how – and considering the two parts of the Polonius test, how they relate to Channel and Content. Of course I don’t think I can put this in the book I’m working on – it would just be authenticity 2.0! After an evening of going through Authenticity again to get an answer, I’ve finally seen what I think is the resolution, which you emailed me about but I’ve just ‘got it’. I know I’m repeating what you’ve been saying, but here it is, finally coming from my mouth! This is about rendering authenticity. My whole post is discussing the fact there is the real and the fake, and that people were ‘Broadcasting Social’, or rather ‘Faking Reality’. 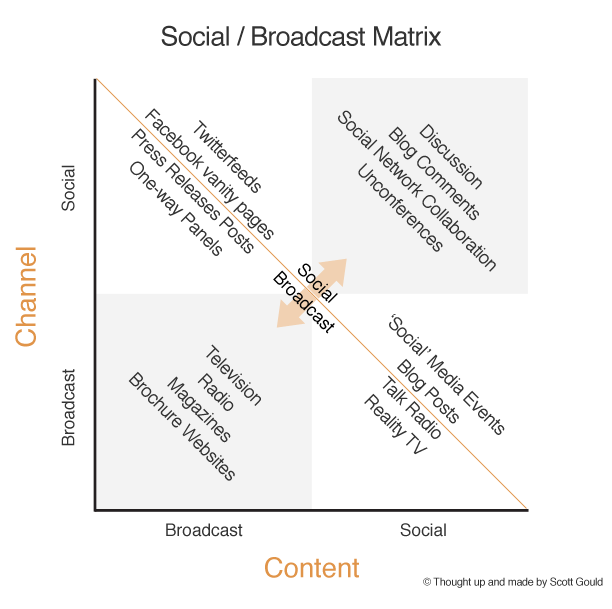 The Social / Broadcast Matrix sits on top of the Real / Fake Matrix – it is essentially an add-on that explains real/fake in a communications context. So the actual discussion here isn’t about Social or Broadcast – it is about Real or Fake – it goes right to your matrix. Mine is just a filter to understand it, as I said, in a comms context. We can then apply your methodology (go faux / create belief / reveal the unreal / get real) to render any of the Social / Broadcast modes as more authentic. The fake/real thing reminds me of what Bill Nichols talks about in ‘Representing Reality’ – the perceived axial connection between the viewer and the content. In documentary, there *is a perceived axial connection – the viewer assumes that the world on screen is their world. In fictive film the viewer perceives that there *is not an axial link between their world and the representation of ‘reality’. I think this is connected to broadcast/fake and social/real. Nichols’ upshot is that in the ‘fake’ relationship, the real ethical relationship with the representation is displaced by an eroticised one (such as watching the zombies get torn up for ‘fun’ he examples). In the real relationship, the ethical relationship with what is depicted remains consistent with real life ethics. (The eg he uses is of a documentary depiction of the dissection of a human body – not fun).